Benjamin Disraeli remains one of the most intriguing of British prime ministers. Born into a Jewish middle-class family, he became famous through his novels and self-publicity, and eventually achieved high political office after many failures. Opinions differ about his achievements, principles and legacy. Disraeli’s father was a free-thinking gentleman-scholar in London. His abandonment of the family’s Jewish religion allowed Benjamin to be baptised an Anglican in 1817. He attended various local schools but most of his education came from his father’s extensive historical and literary library. Disraeli trained briefly to be a solicitor but preferred writing, socialising and fine clothes. However he suffered two major setbacks in the mid-1820s: he lost a vast amount of money on financial speculation in South America, and his first novel was condemned for its immaturity and crude character assassinations of society figures. After a nervous breakdown, he produced a stream of novels and political essays in the 1830s, and sought a seat in parliament. Through the cultivation of contacts, including his future wife, the rich widow Mary Anne Lewis, he was finally successful in 1837. Disraeli made his name in parliament in the 1840s by his association with the ‘Young England’ group of Tory backbenchers who attacked the principles of the new discipline of political economy, and by his trilogy of novels urging paternalistic politics. Most famously, he attacked the Prime Minister, Sir Robert Peel, contributing to his downfall after he repealed the corn laws in 1846. After the Tory party split over the issue of repeal, Disraeli played a crucial role in mobilising and speaking for the ‘Protectionist’ Conservative forces. Though his lowly social background originally ruled him out of a leadership role, his oratory, ability and persistence eventually made him the dominant Conservative in the House of Commons, helped by the lack of alternatives, the payment of his debts by supporters, and the acquisition of a small country estate. He was Chancellor of the Exchequer in the three short-lived minority Conservative governments led by Lord Derby from 1852, and succeeded the ill Derby as Prime Minister in February 1868. Disraeli’s first premiership did not last long. It was agreed that there must shortly be an election, after the passage of the Reform Act the previous year, and his rival William Gladstone made sure of that by rallying Liberal and Irish MPs to defeat the government by attacking the Irish Church Establishment. The Liberals won a decisive electoral victory and for the next three years it seemed that Disraeli, often unwell, had little to offer the new political era. However the hyperactivity of Gladstone’s government made many enemies and Disraeli became Prime Minister of a majority government after the 1874 election. Domestically, Disraeli’s government concentrated on social reforms like the 1875 Public Health Act (which improved sanitation) and the Artisans’ Dwellings Act (which gave local authorities power to clear slums). Such measures were mostly uncontroversial, and were described as ‘dull, suet-pudding legislation’ in contrast to Gladstone’s zealous reformism. However after his death, the Conservatives used them to develop their image as a party sympathetic to the working man. Disraeli himself was most interested in foreign policy. He used the international crisis in the Near East to assert Britain’s importance in Europe, culminating in what appeared to be a diplomatic triumph at the summit of European and Ottoman statesmen known as the Congress of Berlin in 1878. His strong anti-Russian policy in the East, and the passage of the Empress of India Act in 1876, pleased Queen Victoria, who irritated the Liberal opposition by showing her support for him. Disraeli’s gestures towards an ‘Imperial’ policy angered them more. 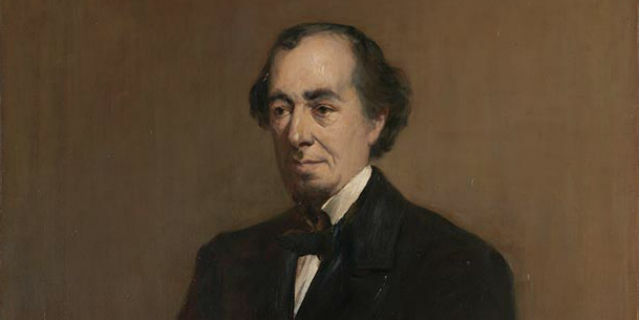 The Conservative party emphasised these when they developed a fully-fledged empire policy in the 1880s and 1890s, adding further to Disraeli’s posthumous reputation. In 1880, however, he lost the election, mainly because of the economic depression and tax increases. He died the following year.